The summit of Mauna Kea, at nearly 14,000 feet in elevation, is home to some of the world's premier astronomical observatories. But the advantage that comes from being above more than two miles of star-twinkling atmosphere is being undercut by the growing problem of light pollution from urban development. 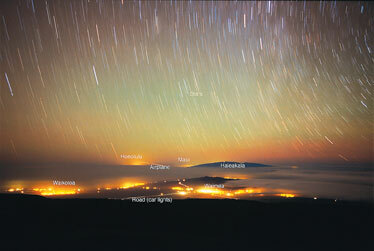 A recent time-lapse view from the summit shows light pollution from towns on the Big Island and Maui and even Honolulu in the distance. Richard Wainscoat of the University of Hawaii Institute for Astronomy said the institute is working with Hawaii County to get better shielding for lights. Without lighting controls, he said, the effectiveness of telescopes on Mauna Kea will be severely hampered.